China’s new third-generation BeiDou satellites are broadcasting some new signals in space. The newest signal, which just began broadcasting from a satellite launched on Sept. 30, is similar to the future GPS L1C signal with time-division BOC(1,1) and BOC(6,1) signals. Such a type of modulation is called time-multiplexed binary offset carrier (TMBOC, see note below). 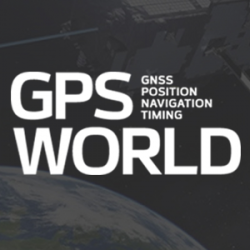 Researchers at JAVAD GNSS have been tracking the new signals, particularly those from Beidou-3 I2S, an inclined geosynchronous orbit (IGSO) spacecraft, NORAD number 40938. I2S is transmitting on three frequency bands. The JAVAD researchers used the decoding approach described in their February 2013 GPS World article, “Signal Decoding with Conventional Receiver and Antenna: A Case History Using the New Galileo E6-B/C Signal” by Sergei Yudanov. As a result, the signal’s structure was decoded and L1C TMBOC tracking has been successfully tested on the JAVAD GNSS TRE-3 receiver. In addition, new signals on 1575.42+1.023*14 MHz (B1-2), 1176.45 MHz (E5A) and 1207.14 (E5B) frequencies for three satellites (PRN 32, 33, 34) also have been decoded and tested. I of BOC(1,1) (red), BOC(6,1) (green) and their sum (blue) vs code shift. dI of BOC(1,1) (red), BOC(6,1) (green) and their sum (blue) vs code shift. C/NO and iono-free “range minus phase”. Researchers Steffen Thoelert, Oliver Montenbruck and Michael Meurer from the Deutsches Zentrum für Luft- und Raumfahrt (DLR, German Aerospace Center) have also been busy tracking the newest BeiDou IGSO satellite. The following diagram shows a spectral measurement of the complete GNSS L-band frequency range, which shows the signal transmissions on B1, B2 and B3 band. The signal was captured with DLR’s high-gain antenna in Weilheim, operated by the DLR German Space Operations Center in Oberpfaffenhofen. In comparison to the two latest Beidou-3 MEO satellites, launched on July 25, the IGSO has an additional signal on the B3 band. The MEO satellites transmit only the QPSK(10) while the new IGSO also transmits an additional BOC(15,2.5) signal. The following picture shows the B3 frequency band separately including a combined theoretical signal (QPSK(10)+BOC(15,2.5)). The newest BeiDou satellite is the first in that constellation equipped with a hydrogen maser atomic clock. A series of tests related to the clock and a new navigation-signal system will be undertaken. China plans to expand the BeiDou services to most of the countries covered in its “Belt and Road” initiative by 2018, and offer global coverage by 2020. Read more about TMBOC in the June 2011 Innovation article “MBOC Signal Options: Performance of Multiplexed Binary Offset Carrier Modulations for Modernized GNSS Systems,” by E. Simona Lohan, Mohammad Z. H. Bhuiyan, and Heikki Hurskainen. 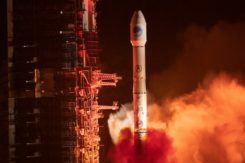 Earlier this year, China stated that one of the July-launched MEO satellites was working autonomously and had set up a link with the other satellite, successfully testing the autonomous control technology of the Beidou constellation. The inter-satellite link realizes communication and distance measurement among satellites, bringing autonomous control of the system a step closer. Autonomous navigation is the project’s key to global operation. It enables satellites to work independently, providing users with more accurate data, according to BeiDou design engineers.